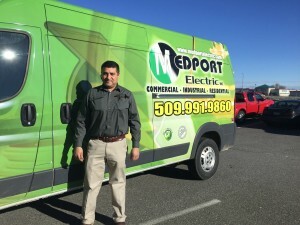 Medport Electric is a small family-owned electrical company in the Tri-Cities, WA serving residential, commercial, and industrial clients. Javier and Elisa Medrano founded the company with the singular goal of offering homeowners and residents unparalleled electrical services coupled with convenience and affordability. Our team has more than 16 years experience offering reliable electrical installation, wiring, and servicing to a wide range of clients. Through the years, our company has developed a reputation for providing top quality, efficient, and reliable service to our clients. We measure our level of success through the number of satisfied and repeat customers. Medport Electric serves Tri-Cities, WA (Richland, Kennewick, Pasco), Sunnyside, Prosser, and Yakima. We work with general contractors, small businesses, and homeowners. If you need competitive prices, and unmatched service contact your Tri-Cities, WA electricians at Medport Electric. Medport Electric’s Service Department has fully equipped service vans that are on-call and available 24 hours a day, seven days a week and ready to tackle your electrical heating and cooling needs. With a staff of licensed journeyman electricians. Our Service Department provides quality work from lighting repair and electrical troubleshooting to small tenant Improvements. It does not matter how big is your needs our team is ready and willing to handle any electrical job you may need to complete. Our company is providing residential, commercial & industrial services, we are ready to fix any problem with the electrical systems in your home or business, whether they are changes, additions or remodels. We go far above and beyond the minimum standards set by the National Electrical Code to ensure you receive the best service. If you’d like to know how reliable Tri-Cities, WA electricians at Medport electric can help your business or home call us today!